Analytics is a set of analytical tools and reports that show how you compare with your local market, and it’s free when you register on the site. 1. Log in to your account and click on Analytics. 2. On the Analytics tab, you’ll see four performance indicators through which we compare your performance with local competitors. 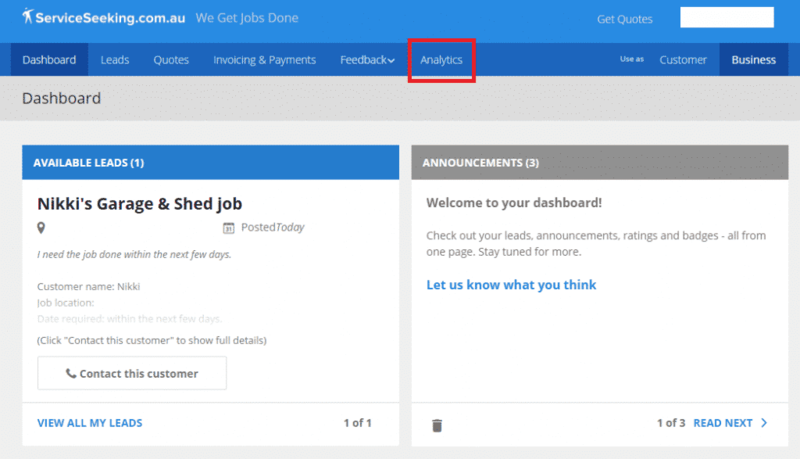 All data that you can see on the Analytics page are based on the quotes you’ve sent through the site in the last 31 days and other businesses that quoted on the same jobs as you. 3. For Market Prices, we compare your average with the market average — are you more expensive or cheaper than your competitors? Your Average Price is your median price for each price type*. The Market Average Price is the median price quoted by your competitors. The Market Price Range shows the low and high median prices for your competitors. Your quotes don’t get counted in the Market Average or Price Range. 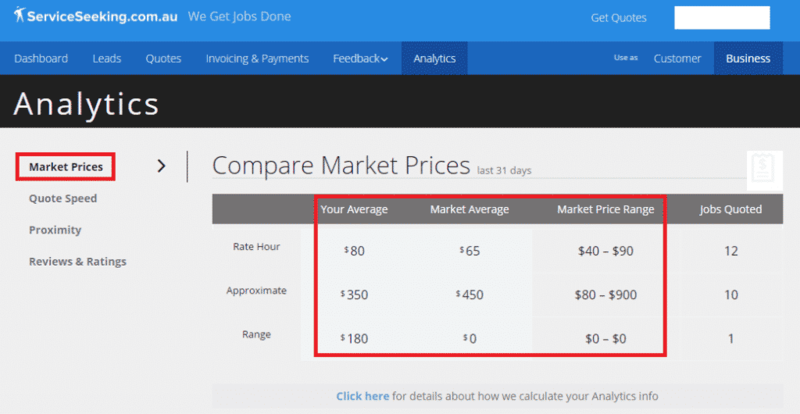 This stops heavy users from skewing the averages and lets you make a genuine comparison between your prices and theirs. *For “Range” quotes, we calculate the mean price from the low and high prices in each range — e.g. (low + high) divided by 2 — then work out the median. 4. For Quote Speed, we show your rank as well as your average compared with the market average. This will easily tell you if you’re quoting on new leads faster or slower than your competitors. Compared to Pricing, this is very straight forward. Quote Speed is the time between when a job was posted and when you quoted. 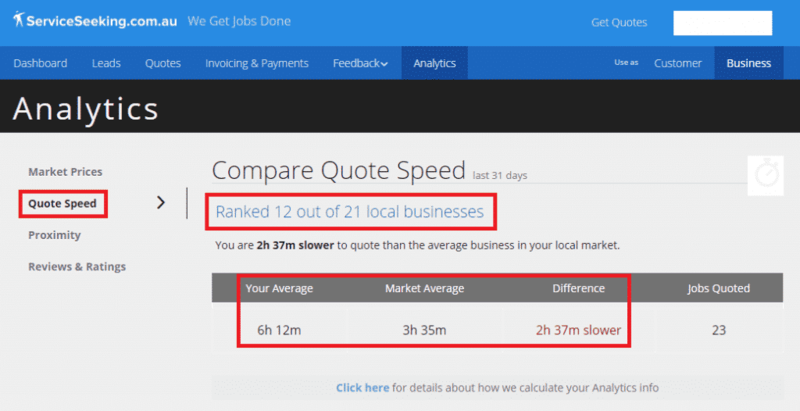 We calculate the Quote Speed for every quote you submitted and do the same for your competitors. Your Average Speed is your median time across all quotes, and the Market Average is the market median. For this measure we give you a ranking against everyone in your local market. 5. 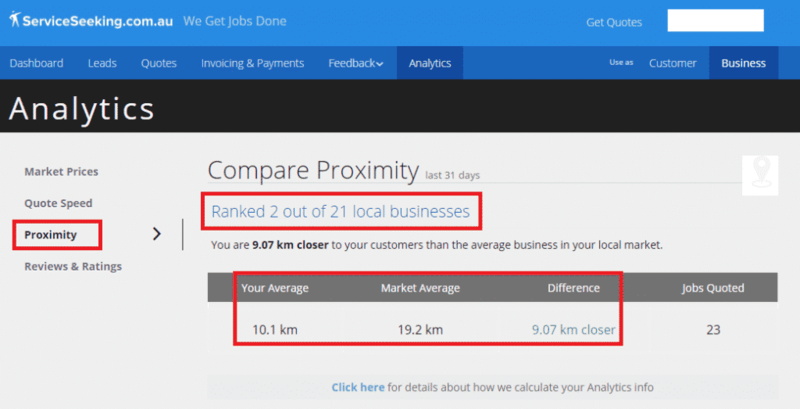 For Proximity, your rank as well as your average compared with the market average are shown. This gives you an idea on how close you are to the leads you quote on. This follows the same method as Quote Speed, except we measure the distance in ‘km’ between you and the customer who posted the job to calculate the medians and ranking. 6. 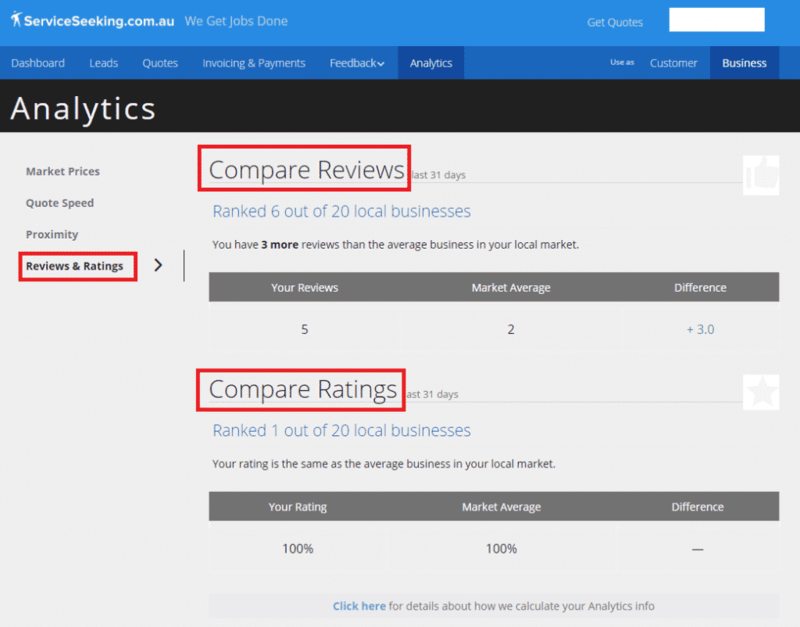 On the Reviews & Ratings tab, you’ll be able to know how many reviews you have compared to your competitors. For these, we rank your competitors by their current Review count and feedback Rating %. Your Average scores are your current Review count and your current % Rating. The scores are the median Review count or current Rating for your competitors. We don’t work out what the Review count or rating was at the time each bid was submitted.